I’d like to use this post to suggest that there is a massive poverty of aspiration in our schools which urgently needs addressing. But my argument is not the one that has been made many times before. Rather, it is that of a poverty of aspiration among teachers, when considering their own professional achievement. Laura McInerney (@miss_mcinerney) recently posted a blog as part of the fascinating #blogsync series on how she would raise the status of the profession, focussing particularly on the professionalism developed as part of the TeachFirst programme. This was followed by an excellent post from Mark Robinson (@DrMarkARobinson) which reflected on the need for teachers to use their skills to guide policy-making. My contention is that too few teachers have the confidence to do so. And that much like our central government is right to urge schools to challenge low aspirations among pupils, so we must raise the aspiration of our professionals to engage in, and begin to lead, policy debate. The parallels with students in schools are striking. There is much talk about cultural capital for students; knowledge and experience that will allow students of all backgrounds to compete with those from the most privileged backgrounds in fields of education and employment. I would argue that some similar capital is lacking for too many teachers. When I look at educational discussion on Twitter, much of which is of excellent quality and real value to the broader profession, too much of what I see is centred around secondary teachers in urban areas – particularly those from high-prestige training schemes like TeachFirst, and particularly from London. It is, of course, inevitable, that the largest city in the country will lead the way by volume, but it is less clear why certain sectors might do so. Laura McInerney’s point about TeachFirst professional development is undoubtedly significant: Russell Group applications have become something of a by-word for high achievement in some areas, and so there is a good deal of aspiration-raising work going on that makes clear to students of all ages and backgrounds that an application to a Russell Group university is an achievable goal; The TeachFirst programme appears similarly to expect of its students that they will tackle challenges broader than their own classroom, thereby raising their own aspirations and expectations of their achievement in wider fields. The contrast with the average classroom teacher – particularly in primary schools, I suspect – is marked. For many teachers, their only experience of anything outside their own classroom is that of staff meetings and Inset training. Few opportunities for observing good practice, few opportunities for work with other departments, let alone other schools, and few opportunities for a strand of professional development which seems to offer so much to those on the high prestige courses. Many teachers of all backgrounds have begun to take on their own professional development, using Twitter, TeachMeet and other sources, so well described by Dr Robinson. But still the number of teachers reached is relatively small, and still too, the breadth of professionals met is too narrow. While I have much to complain about with the current review of the National Curriculum, and this government more generally, it does seem that the new curriculum may offer an opportunity to return to the profession some confidence in its own power and authority. Again, particularly at primary level, the prescriptive nature of things like the primary strategies and APP have for too long treated professionals as merely agents of delivery. Arguably, for the last 10 years, trainees have been trained for exactly this purpose of delivery. For that reason, grasping this new opportunity will not be easy for all. I have already expressed my hope that a new form for the College of Teaching might help to raise levels of engagement and professionalism. It certainly strikes me that something is needed to inject a heavy boost of confidence into thousands of teachers nationwide to remind them that their expertise can carry weight at all sorts of levels. Twitter is a good starting point, and hopefully the experiences of those trained by TeachFirst and those who attend Teachmeets will start to ripple out. But right now, we need something more widespread to really kickstart a professional confidence boost. We just need to work out exactly what will achieve that! Although we will hopefully see some substantial change to some aspects of the new National Curriculum proposals, it also seems quite feasible that much of it will remain the same. With that in mind, I thought it useful to map out some of the key elements by year for ease of reference. Accordingly, here is a single-page overview for each of the primary year groups, showing the main content to be covered in each subject. Core subjects and History are covered year-by-year, with other subjects set out on two-yearly cycles. 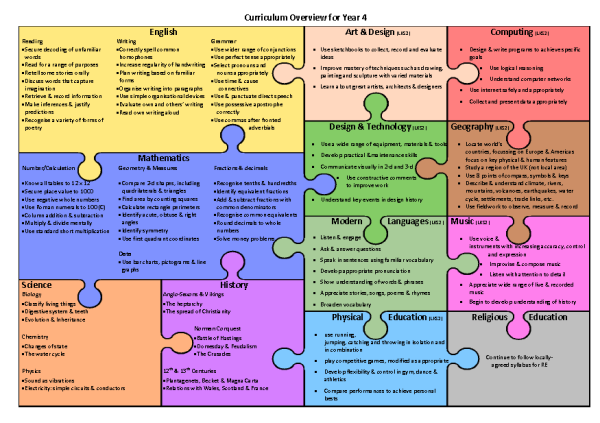 The year-a-page document for KS1 & 2 can be downloaded here: Curriculum Overview for Years 1-6. This blogpost is written as part of the May 2013 BlogSync category. It’s something of a politician’s tack, I recognise, but every time I read this question, only a question springs to mind in response: what do we mean when we talk about raising the status of the profession? As I have already commented in a recent blog: it seems that some teachers have a tendency to focus on the extremes. And it would be fair to say that at the extremes of the media – the right-wing press particularly – it is easy to find stories which portray schools as failing, and teachers as failures. But they also contain reports that suggest immigration is brining our nation to its knees, that Health & Safety demons are ruining fun nationwide and that the nation is still not yet over the death of Diana. I see very little evidence of these claims in real life. A Which? survey in 2012 showed teachers were highly trusted, with only doctors and nurses scoring more highly. TeachFirst tell us that teaching is now the fourth most prestigious career for graduates. Surveys suggest that 80% of people respect teachers and that teachers in English schools are paid above the OECD average. So what is it that we want to change? In the first case it seems that the public considers the profession to have reasonably high prestige, and among graduates, moreso. In the case of esteem, it seems that generally the public trusts teachers, and presumably therefore holds them in relatively high esteem. So does the issue come down to status in the sense that the report holds it: the ranking of the profession by other “knowledgeable groups” such as politicians, civil servants and social scientists? Well, here it strikes me that “knowledgeable groups” are not homogeneous. It would seem that some politicians are happy to stoke the stories of failing teachers in failing schools. But equally, there are those who are very supportive of the profession. We seem to be no closer to a solution. I’m minded to suggest that the key issue that teachers face in terms of recognising the status of the profession, is that of the politicians. In particular, the current government that seems so happy to denigrate the work of professionals in state schools, and to talk down the education system in which they serve. Notably, just today,when asked about his apparent inability to ‘listen’ to the profession, the current secretary of state for education, Mr Gove, was quick to point out that the profession does not speak with a united voice. Now while it will never be possible for all teachers to agree on all matters, it does further raise the matter of whether a Royal College of Teaching – under that name or any other – might finally provide the profession with a professional voice of unity to replace that chanting discord of annual union conferences and to provide a response to the constant barrage of disparagement? And then maybe we might just see teachers self-evaluation of the status of the profession? It’s been a fair while since I took my first step into a classroom knowing that I would be paid for the pleasure. Over that time I’ve got better at some thing and worse at others. But there are some things that I’ve come to be sure of. No great answers; no real wisdom… just experience. I realise that this is very sad, but when I was young I quite liked playing at being a teacher. I had a little exercise book into which I recorded the register of my imaginary pupils. I set homework (long before I actually had any myself!) and organised my class in rows (despite that never happening in any of my primary classrooms). At that age the things that seemed fun to me were doing the register and telling children off. When I first got my own class I was still excited about doing the register for real, and about writing reports, being on playground duty, parents’ evening… all the things that made me feel like being a real teacher. It turns out, the novelty soon wears off! Every teacher knows deep down that being liked isn’t a sensible aim in teaching. That said, relatively few want specifically to be disliked. It can be a fine balance to strike. In my early years I was probably “liked” more than I am now. It didn’t make me a better teacher, and it didn’t help those first cohorts. I wasn’t weak, or ineffective, but I just wasn’t as effective as I might have been. If truth be told, I was nervous of parents in my early years. Fearful that perhaps they might catch me out. Reality is not quite like that. Most parents are happy so long as their child is happy. But for those fringe cases, the first contact you have with a parent can be instrumental in making the year go well. This is something I’ve seen best in others. At the start of an academic year a colleague knew he was receiving a child with a reputation for challenge, and for a challenging parent. He took steps to make contact with that parent before the year even began, to outline transition plans, to discuss how best to meet his needs, and to make arrangements to catch up again in September. The parent was won over before the year even began. It didn’t make the problems go away, but it made it a partnership for dealing with them, rather than a confrontation. This isn’t true of all behaviour, sadly, but it goes a long way towards it. High expectations breed high standards; I have no doubt of that. My Y7 cohort have had their assessment week during the same week as the Y6 National Curriculum Tests in a neighbouring corridor of our middle school. In Year 6 they took as few as four tests, and the remainder of the week was a far more relaxed affair. They were rightly rewarded for a year’s effort towards that monumental event. My classes took 8 tests, including longer ones than they had in Y6, and in between they got on with their regular lessons. One child asked if there was going to be a “relaxation” day on Friday. I told them they had the relaxation of RE, English and other lessons. The child responded with a knowing smile, a mock roll of the eyes, and carried on. I was comforted that my message of hard work was clear. The children knew what was expected of them, and they expected it to continue. There were no complaints, no arguments, no moaning. Just a recognition that they were older, and expectations were higher. I hate residential visits. Or at least, I do at this stage: I’m currently organising one that leaves in a few weeks, and starting to organise one for the following year. They’re a nuisance, they demand too much of my time, they exhaust me, and they bring relatively little return to me as an individual. And yet, I wouldn’t stop doing them! An opportunity to work with children in a completely different environment; to see them meet challenges that are new to them – even if it’s just making their own bed; to engage with them individually on a different level; to form memories that you know will last them a lifetime. Who could turn that opportunity down? I shouldn’t be writing this. I have a residential to organise; I have reports to write; I haven’t yet finalised my Writing assessment levels; I haven’t planned my lessons in detail for next week. The list is endless. It always will be. But we cannot allow the guilt of the profession to weigh constantly on our minds. Yes, there is always something that needs doing, and even then more that could be done. We are, though, mere mortals. Learning to package the guilt and to set it aside for a few hours is essential for your mental wellbeing. In line with number 6, there are always things you could do to make your teaching just that bit better. But it is important to balance the potential with the effort and energy required. Will making 30 sets of beautifully laminated illustrated problem cards help the children to learn how to multiply any more effectively? Sometimes primary teachers particularly have a tendency to prettify more than they need. And if that’s the way you like things, then so be it. But be wary of bemoaning a demanding workload for which the only demandant is yourself. Training gets delivered. I could train you in the teaching of Maths, or how to use Moodle, or how to teach phonics (well, not that one, but the point is the same), but that’s just not the same as professional development. That has to come from you. I went on a series of ‘new teacher’ course as an NQT. I can’t remember a thing I learned from them, but who knows, maybe they were useful at the time. Now, however, very few courses would appeal to me. Sometimes training is important – new software, new models of working, etc. But for real professional development you have to take the lead. The starting point I’d recommend is Twitter. I’m currently reading Daniel Willingham’s “Why don’t students like school?” and I can see already the impact it will have on my teaching. I would never have known about it had it not been for Twitter, and I cannot see a single circumstance in which “training” would have delivered the same benefits. Don’t wait for someone else to put you on a course: get out there and find what will help you to become a better teacher. Twitter and blogs are an excellent starting point. 9. You will be cast as both hero and villain. You are neither. In my experience, teachers have a tendency to overemphasise the extremes. Two parental complaints in a year will bring some teachers to the edge of resignation. Two parental compliments can leave them on Cloud 9 for days. As ever, the reality lies somewhere in between. Of course take note of what is said at either end of the spectrum, for better or worse. Keep the complimentary cards and letters for a lifetime; discard the complaints at the end of the year. For your own benefit, though, let neither have too significant an impact on your life. The old “you only work 9 till 3” and “always on holiday” jokes can seem irritating. Sometimes they are. But those who make them generally fall into two camps. One group know all too well what a joke they are making. They are often the long-suffering partners, children or family members of teachers. They make the joke in sympathy. Accept the sympathy. Others will make the joke through ignorance, and no small amount of argument from you will change their view. I find that in these cases the best responses fall into two camps. Generally I stick with “Yes, it’s great – I don’t understand why more people don’t teach!” In most cases the joker will soon explain their rationale – usually another misunderstanding of the role, but sufficient to demonstrate that they’re not up to the job. Why Mr Gove is right… and yet so wrong. Gove is realising that the NC is a very blunt tool for achieving his (not all unreasonable) intentions. But blunt tools do much damage! I felt that a more detailed clarification was in order. So firstly, let me deal with the part in brackets: I happen to think that a lot of what Mr Gove says is… reasonable. This is not always a popular view, but actually there is much that he says that it is hard to argue with, without sounding foolish. He talks frequently of having higher expectations of students in English schools. With that, I agree. He talks also of the importance of providing opportunities for those who come from poorer, or otherwise educationally-disadvantaged backgrounds. Who could not agree with that? He also speaks of the importance of a sound understanding of grammar. That is perhaps a more contentious point in some senses, but I happen to agree. I also happen to think that there is some merit in his calls for increased focus on knowledge acquisition. It is too easy to talk about Google, or 21st Century learning, or of ‘skills’ without giving this point of view the credit it deserves. It is not enough to say that proposals are old-fashioned unless you can also demonstrate that what we have now is unquestionably better. And I’m not sure it always is. I have met with Mr Gove’s former ministerial colleague, Mr Gibb, who has explained clearly to me his concerns about lack of knowledge. He bemoans the lack of quick recall of things like Victorian Prime Minsters. I struggle to share his concern, and happen to think that in an information-rich world, the analytical skills of interpretation, source evaluation and analysis are vital for our young people . But I do understand that there is a risk of the emphasis on skills in some areas being at the cost of some knowledge in others. Take the Geography curriculum. At present the KS2 curriculum requires that we teach children to “ask geographical questions”. This strikes me as a rather meaningless objective in a world where children’s curiosity should be assumed and fostered. In the draft proposals for the KS2 Geography curriculum we will be required to teach children to “name and locate counties and cities of the United Kingdom”. That strikes me as a perfectly reasonable aim for 11-year-olds – and one that is likely to be of some use to them. And it’s been lacking. I have no objection, therefore, to a review of the National Curriculum. Indeed, I welcome it. However, I rather suspect that Mr Gove hopes to achieve a good deal more with curriculum reform than is possible. He seems to yearn for a return to a golden heyday of Latin and Dickens which probably never existed, and certainly isn’t appropriate to 2013. And he seems to believe that the National Curriculum can achieve that. Or at least, he did. The National Curriculum is merely text on a page. It has no soul, no life, no real embodiment. That can only come from teachers. Even that other over-used lever of central government – the examination framework – is only a screwdriver in the workshop of education. And it too is blunt. And as I’ve said already: blunt tools can do more harm than good. The real power of the education system rests in its professionals. What happens in classrooms, what is taught to our children, what is achieved in schools, remains almost wholly outside of the control of the Secretary of State for Education. And rightly so. Sadly, what Mr Gove has chosen to do is to try to force his views upon schools. A curriculum drafted in secret, re-drafted in his office, and presented as a fait accompli will not work. Worse, it serves only to fit the caricature of a power-crazed autocrat from the past. And it could have been oh so different. Mr Gove could have worked with teachers. He could have used the expertise of people like Willingham to whom he so often refers, and he could have tried to build a consensus view of the purpose and value of the sort of education he desires. And it may even have worked. Not everyone would have been persuaded, of course. And never would there be total agreement. But he might just have managed to take the profession with him on some of those common sense issues; even persuaded a critical mass on some of the more controversial matters. But most importantly, he might have created a common force for improvement, rather than creating a battlefield for opposing arguments. Politicians come and go. Their ideas often come and go with them. If Mr Gove had really wanted to have achieved real and lasting transformation for the better in our education system, then he should have tried to work with the parts that really make the difference: the people standing at the front of those classrooms, not the folders on the shelf in the cupboard. Just think what he might have achieved with a more collaborative approach, a good use of real evidence and maybe even some investment in those teachers who wanted to join the journey. In schools that are not yet good,leadership focuses too much on organisational management and not enough on pedagogy and the leadership of teaching. I’d like to suggest that Mr Gove change his attention away from attempting to force change through organisational management and turn his attention to the pedagogues. If he can persuade them on the key points then he’d find his journey much easier. An elephant in the staffroom? Why do we have to learn algebra*? When am I ever going to use it? Every teacher in the land will have heard a phrase like this at some point (*insert a curriculum theme of your choice, naturally). There are blogposts, articles, and plenty of staffroom conversations around that suggest a set of responses to these questons. Links to careers abound; examples of ‘real-life’ uses, and ‘real-life’ users aplenty. And yet, none quite gets to the nub of the problem in my opinion. Because the reality is that for many of our students – particularly as they get older – much of what we teach them will never be directly useful to them in a career or daily life. I’ve never used trigonometry, or asked a Frenchman where I can buy bread, or needed to know the difference between ionic and covalent bonding. But that’s not the point. And as teachers, we know that. We know that there is much more to the purpose of schooling, education, learning. But only too rarely do we share that with our students. The system implies that we must value examinations, national curriculum levels, progress, attainment… but these are merely indicators and measures. They should not – indeed must not – be allowed to become the purpose. Frequently, when international comparisons are drawn, arguments are made about the different perceptions of education in, say, Korea or Japan. And they are right. Yet we seem to do little to address these. Similarly, when private education is mentioned, those of us in the state sector point to the importance of the values of those who choose to pay for education. And surely we recognise that it has an impact. As schools battle to increase percentages of students at level 4, or achieving 5 A*-Cs, or gaining places at Oxbridge, how often do we look for interventions, teaching strategies, programmes and booster sessions? We vaunt the importance of attaining goals to allow access to something more – but never for the value of learning itself. Similarly, in the current debate about relevance/engagement versus challenge and ‘rigour’, how often do we consider ways in which we can make learning “fun” or “engaging” through some other element, rather than valuing the learning itself? What if we really began to teach what matters: the value of learning? What if, from the earliest age we taught the children in our care that they are privileged to receive such education, that the value is not in what can be attained in the short term, but in the process itself? What if we were honest enough to say to our students: you might never use this information, but do you know what – it’s worth learning anyway? Consistently. To all of them. At every age. Then maybe we might start to see students themselves valuing the process, and recognising the outcomes merely as recognition of their journey, rather than as barriers to be overcome. Many agree with the oft-quoted phrase that “Education is not filling a bucket, but lighting a fire”, but in this analogy at the moment we’re too often working with firelighters & spirits and fanning a feeble flame to cook a single sausage. How much better might it be if we could just start off with dry twigs and kindling and let our students enjoy the full feast? It’s not as easy as a punctuation booster session, but the impact could just knock everything else out of the park. I have no idea. And amazingly, neither do you.